News	Forums Dreamcast Dreamcast Community Just got a dreamcast, a few games. Love it, check out my collection so far! The blue vmu has original packaging but is defective. Grandia 2 doesn't have the manual (if it had one) but has soundtrack. Power Stone 2 is complete. Marvel vs. Capcom was in the console (loose buy) when photo was taken. Looking to pick up the sonic games, power stone, crazy taxi, and Skies of Arcadia for a reasonable price (lol). Found them all at an exorbitant price around the area, assuming complete. What games are good to back up and play? It's temporary obviously, gonna end up having them eventually. Hoping to get a dream pi, cant afford it currently. 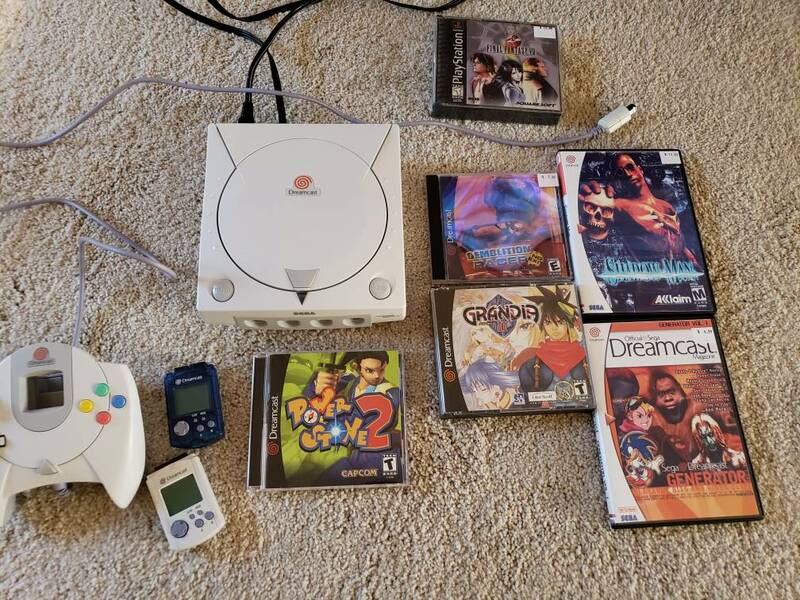 Re: Just got a dreamcast, a few games. Love it, check out my collection so far! Sounds good! Can't wait to be online. You should try to check out Metropolis Street Racing! i dont like that game its too hard.. if you like REALLY hard stuff then MSR is for you..
My collection's been growing in the wake of my dreampi purchase lol. I even got a handful of these sealed! Chu Chu Rocket, NBA 2k1 (? ), Quake 3, StarLancer, 4x4 Evo, Alien Front Online, Ooga Booga, and PSO. I have a copy of Worms World Party on the way, too. Rayman 2, Grandia II, Sonic Adventure, Sonic Adventure 2, Army Men: Sarge's Heroes, Soul Calibur, Tomb Raider: The Last Revelation, South Park: Chef's Luv Shack, Hydro Thunder, Crazy Taxi, Resident Code: Veronica, Blue Stinger, Super Magnetic Neo, Jet Grind Radioooooo, Tomb Raider Chronicles, and Shenmue. In the mail are Walt Disney World Magical Racing Tour (guilty pleasure lol) and Star Wars Ep1 Podracer. I also have some high quality repros on the way too, though I'm not too proud to be playing burned disks on my system. I just don't want it to die a premature death. I also should have maybe not bought one of them lol. It's both Power Stone games and Propeller Arena. With Power Stone 2 being so stupid expensive, this CIB repro was a good alternative, but I found out too late that a real Power Stone 1 was actually affordable loose. Oh well.